Timeless decor is a goal for most home decorators. It works and is in style and feels fresh and updated for al long time. And the best part is that it is achievable! 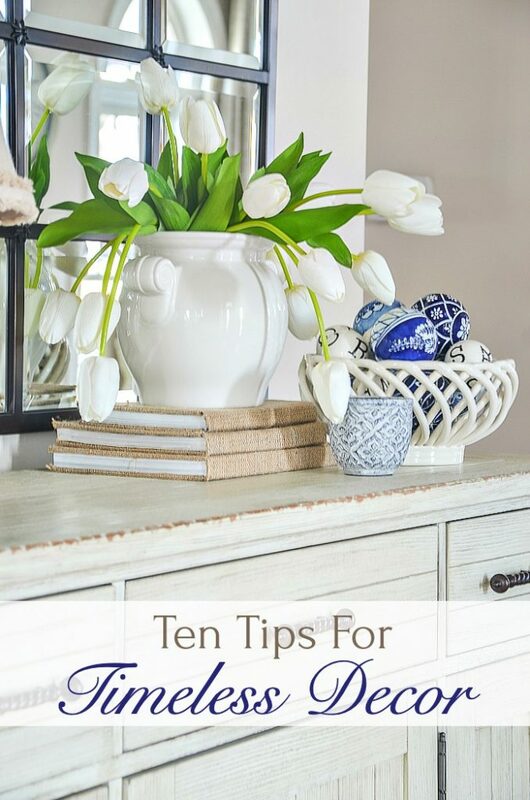 Here are 10 tips for timeless decor. When it comes to style I have a bit of a short attention span! I’m wild about many current trends and styles. But I’ll admit that I get tired of them quickly and am often waiting for the next newest decor trends to come around the corner! 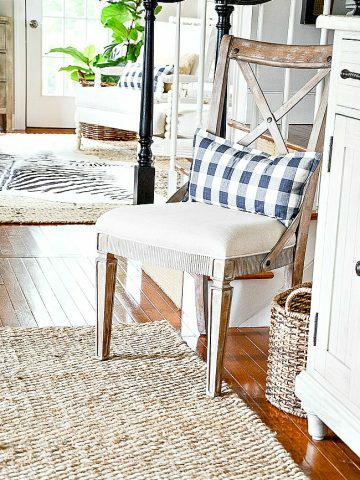 I love beach, and farmhouse and modern styles. Traditional, transitional, bohemian, industrial and midcentury too. Art deco, cottage, French and cabin! And that’s just some of the styles that make me swoon! But most of all I love love love a timeless look. You know, decor that is so perfectly classic that it looks as good today as it did ten years ago! It’s true decor beauty! Timeless decor also is great when mixed with other styles! I think this decor should be part of almost everyone’s decorating! Timeless decor is classic! It’s stood up to time and won! Timeless furnishings should be comfortable! If you are going to have a piece of furniture, like a sofa, for a number of years make it the most comfortable one you can find. Look for well constructed pieces and wonderfully time-honored fabrics! This is where you should be spending the bulk of your decorating budget. Make sure the styling is not too trendy or lack luster! A classically beautiful sofa or chair or table is the backbone of a timeless look! The buffet in my foyer is a lovely, well-made piece that I’ve had for over 5 years. 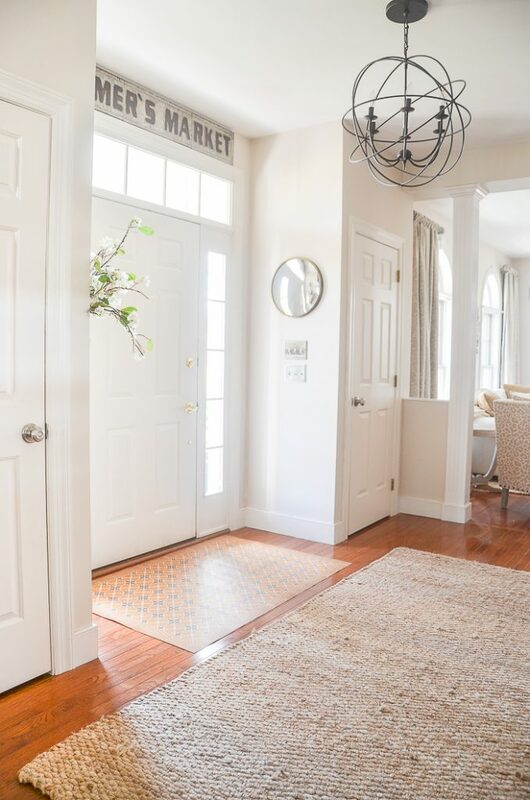 I think it still looks fresh and updated and because it has a timeless modern farmhouse look it will live in my foyer for many, many years to come! Timeless decor means fabrics that will stand up to years of changing trends! They transcend those changes. Don’t rush out and buy foundational furniture in the “color of the year”! It’s only the “color of the year” for one year! Choose colors and patterns, especially when buying big ticket items, that will still look amazing when this year’s trends have come and gone! Think CLASSIC! Add layers of accent decor like lamps, art, tableware, pillows, bedding, etc. in more updated colors and styles. They can be changed out easily when they get tired or are out of style! Introducing a new color or contemporary style is so easy if you have timeless pieces! 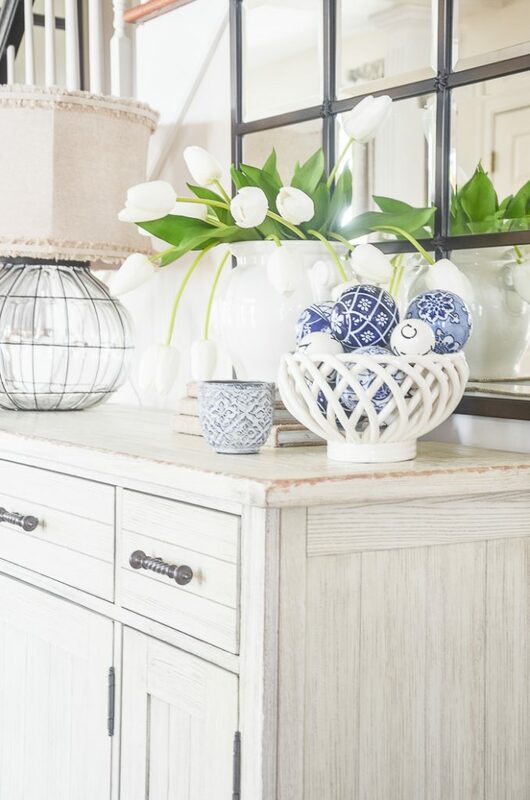 This season I added a bit of blue and white done in a vignette on the foyer buffet! 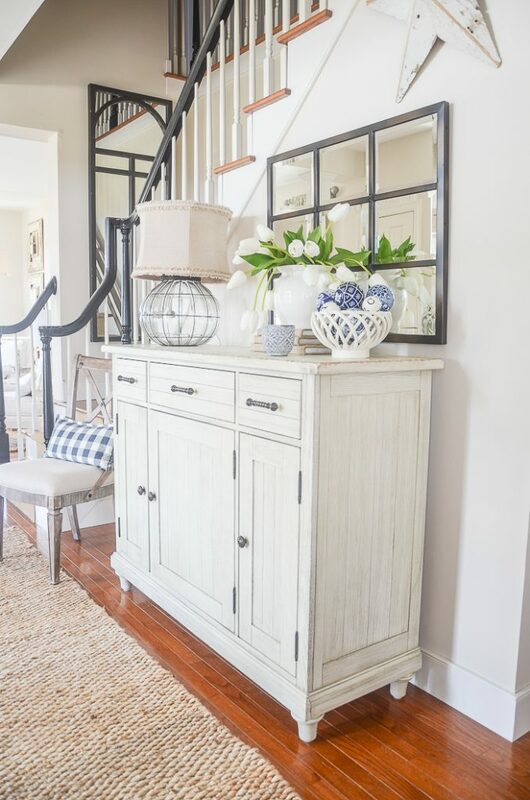 Right now I’m loving blue and white in the foyer but probably not for the long haul. 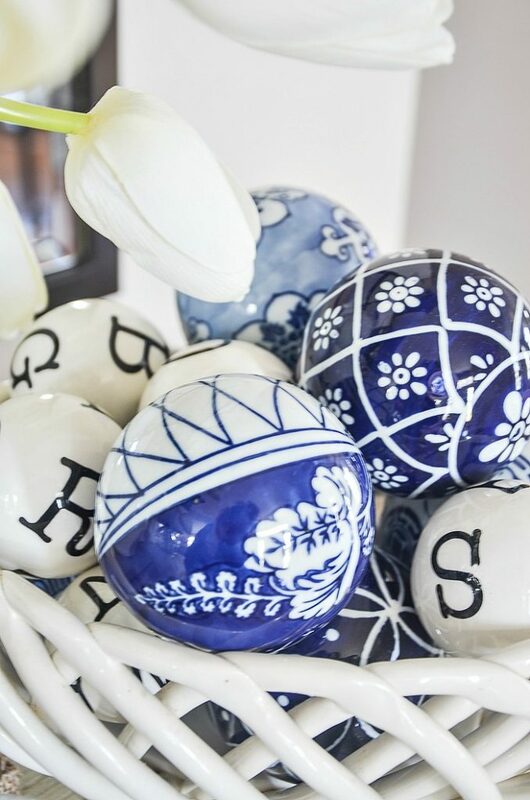 Using blue and white porcelain balls in a traditional white bread basket is just the bit of trendy fun I needed in the foyer! Pillows and throws are like jewelry to our home decor! They can be relatively inexpensive and add lots of pop and pizzazz to a timeless look! Here’s where to add just-now colors and patterns! And have fun! 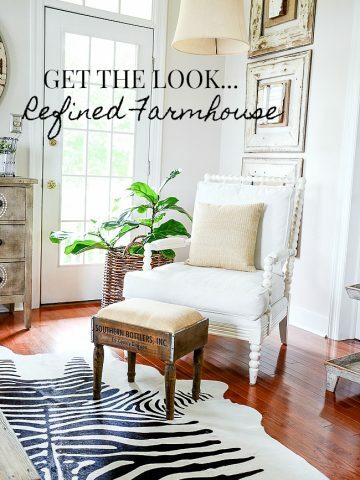 When furniture is timeless introducing a little decor trend and sass is possible! Neutral colors, for me, are the biggest bang for my bucks. They are perfectly timeless and these tone-upon-tone colors work with almost any color or style! And they play so well together! For me, living with neutrals is a delight! Neutrals never go out of style! They evoke a clean, fresh feel and are the epitome of timeless decor! Since I changed to a neutral color palette almost a decade ago my home feels fresh and up to date no matter what’s new in the decor world! It was the best decor decision I have ever made! See 6 REASONS TO LOVE STONEGABLE’S COLOR PALETTEIt is filled with ways to update a look with neutrals. Timeless decor respects the space it’s in. No need to crowd a space when you are decorating with timeless, classic furnishings! 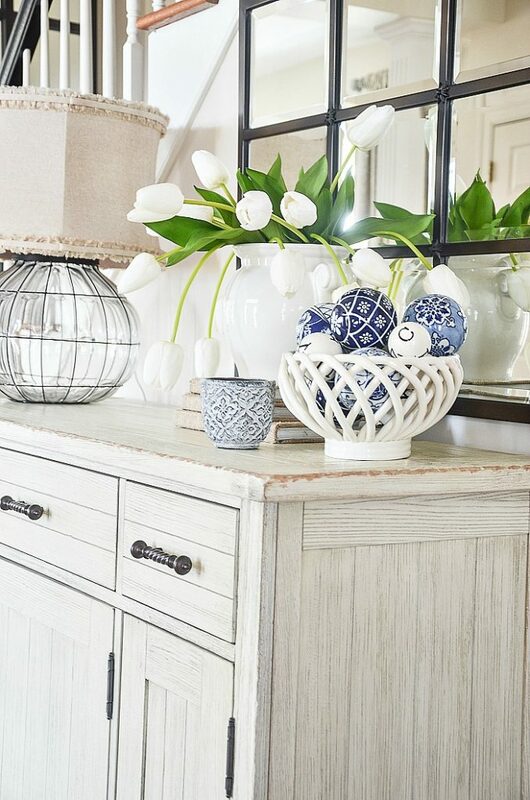 Honor each piece of this beautiful decor and give it room to breathe! This is a little hard for me! I love to fill my rooms. I’m still learning this tip! Spend extra time to think about and choose every decor detail with care. Pay attention to lighting and seating and mirrors and art and candles and objets d’art. Everything! With a timeless look, less is often best. Ask yourself if what you choose to put in a room is something you love and is worthy of the space it takes up! Give yourself time to sit in a room and day dream about how it could look. This is time well spent! Even the empty spaces in a home should be thought out for a timeless look! A Timeless look often blends old and new. I absolutely love this look! It looks collected or curated. Mixing classic pieces from different times is an amazing way to bring interest and beauty into your decor! Now is a fabulous time to put this tip into practice! Painted furniture is a new classic and not just a trend anymore! So paint an old outdated piece of furniture with a great new fresh color. Or upholster something outdated with a pretty new fabric! It’s like giving a second life to decor! Many of us love to collect something! And if you are a collector I bet you love showing your collection off. For a timeless look, edit your collection to only the “best” and display them. Or rotate your precious items and display a few at a time! Less is more when it comes to displaying collections because they often date a look. Which is the opposite of timeless! So display with an edited hand. I am an avid “dish” collector! And I use my dishes as accent pieces all over my home. But I’m leaning that a little at one time can go a long way! To “curate” means to choose, organize and look after something! Today, we have talked about “choosing” timeless decor. 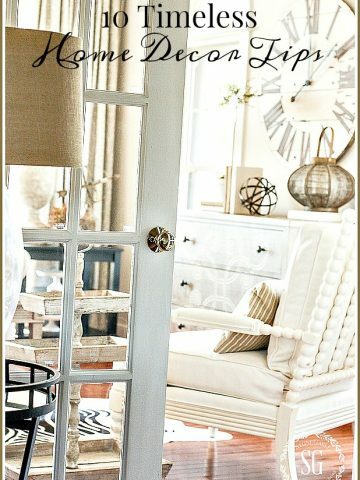 We have mentioned “organizing” or how to use your timeless furnishing in a space. Now let’s make sure we look after our furniture to keep it looking it’s best. Part of a curated look is “caring” for it! A timeless look is well cared for and neat as a pin. Free from dust bunnies and stains! 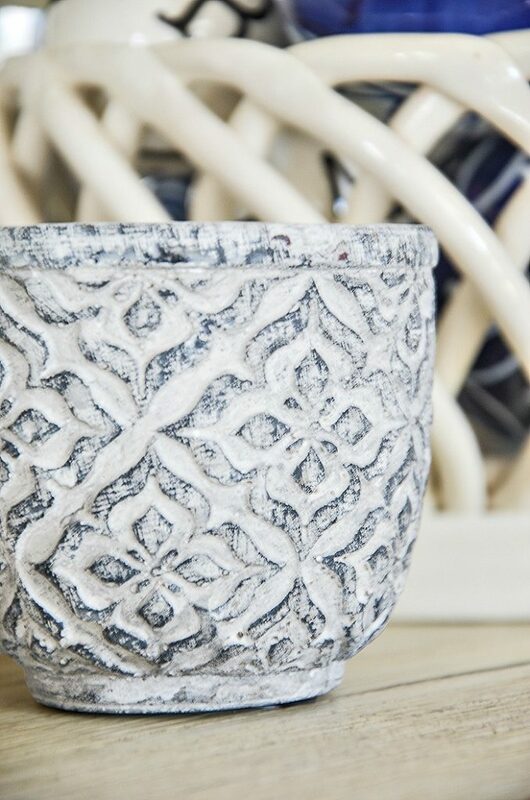 Nothing ruins a timeless look like unkempt areas and furniture that has seen better days! Here’s the good news. When a timeless piece finally starts looking tired, it can be repainted, slipcovered or reupholstered as long as the frame is still good! And it can continue to give you years of service! Most important of all is to live with what you love! If you are looking for that timeless, classic, amazing look choose pieces that YOU love! It’s your home and your sanctuary! Make it a reflection of wonderful YOU! And don’t settle for any decor you don’t love! Make sure you want to live with what you have not just tollorate it! If you love that timeless decor look that so many of us do,you now have a few tips to help achieve it in your home! Achieving a timeless look is a process! Enjoy the journey! Now it’s time to put these tips into practice! What is your favorite thing about a timeless look? Please share! What color is the paint in your home? Thank you! 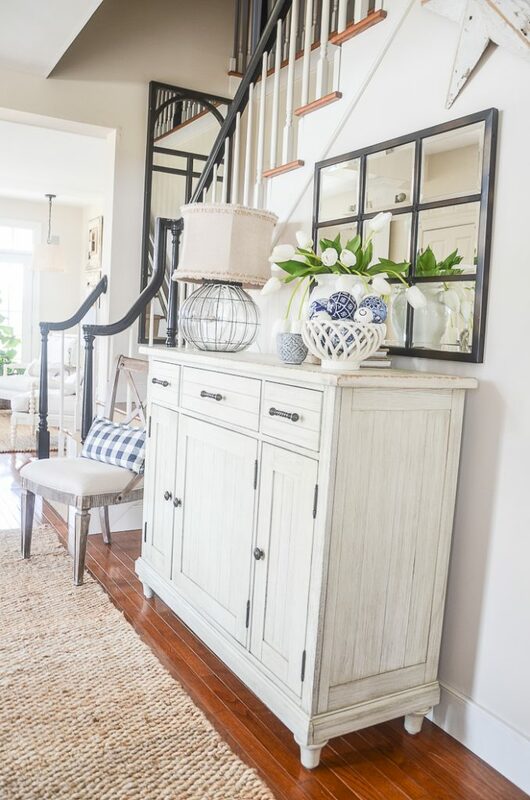 Beautiful foyer! Do you have a source for the tulips? The tulips are from a local shop. Sorry! Hi, what a beautiful home you have, one of the best articles I have read about décor. I too am into timeless and classical look and have never been a slave to trends. 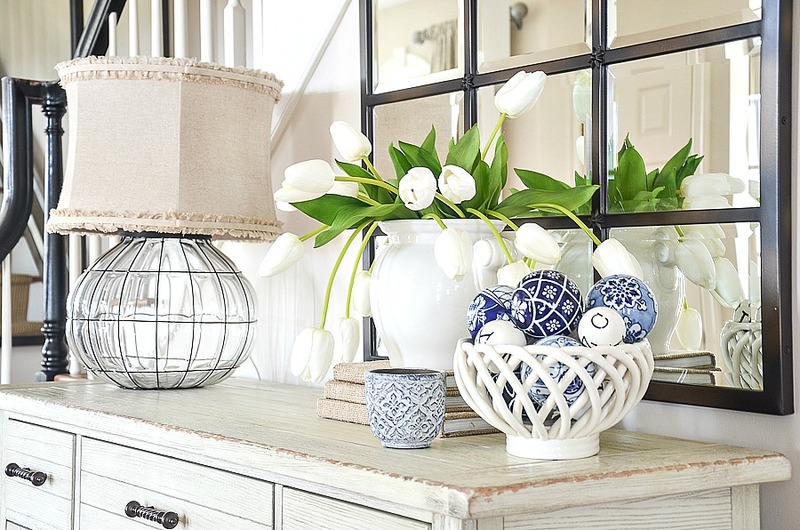 Pretty, love the blue porcelain balls. I have a few and I always look for them at sales. Love the neutrals with the pops of royal blue. Cute idea covering the books with burlap. Beautiful, inviting and fresh! 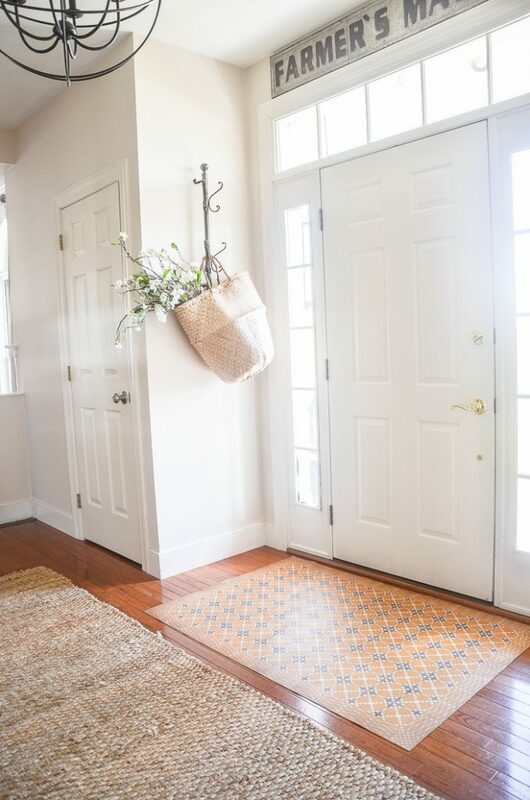 I love the basket with flowers hanging by the front door. Where did you get the basket and hanger? Your house is always perfect I guess you dont have a 70 pound hairy dog. Please any tips for people with dogs. I do have a 50 lb dog, Beau. But thank goodness I like to vacuum! The basket came from a local shop. Sorry, I don’t have a source. Great article Yvonne! Can tell us the source of those interesting lettered ceramic balls? Very cool! Hi, the lettered balls are from Pottery Barn. I don’t see them on their site anymore. Just gorgeous as usual Yvonne. We have been on a 3 year plan to refresh and update our look – first, just to enjoy the improvements and changes for ourselves, and second, we are planning on downsizing in the next year or two. The plan has been very strategic – while making updates such as granite and backsplash, painting, new light fixtures, etc., it has also included many items to be used in our new residence. All the colors are neutrals, with the exception of a beautiful Pottery Barn rug in shades of blue/cream/taupe. New bedding is all ivory with pillow accents. It all works for us right now, will be good for selling our home, but will also be lovingly used in our new townhouse. I agree – editing and reducing decor makes a whole house look cleaner and fresher. So many of the decorating blogs that I see are literally overloaded with “stuff”, it makes it look like the decorator is trying too hard! So smart Lyn! Thanks for sharing. I hope other readers see this comment. It is so helpful! Have always loved blue and white and it always looks like a breath of spring. Will start in on my Easter decor now that St Patrick’s Day has passed. Enjoyed our Irish dinner and even made Irish Soda bread. Looking forward to an entire week without rain. Maybe will even do some gardening. 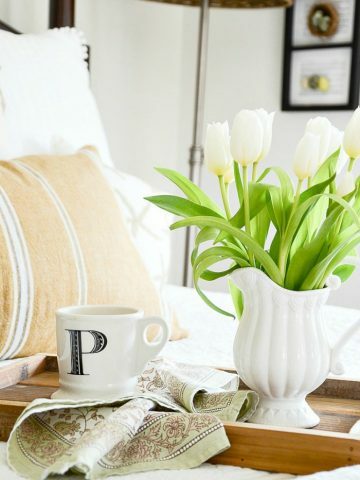 Think I will look for some Tulips at the grocery store to arrange in a pretty vase for the kitchen.Happy Spring. How sweet of you Laura! Thanks!